Leaders meet to decide if to adopt full anti-Semitism definition after internal strife on issue and souring ties with Jewish community. Leaders of Britain's main opposition Labour party met Tuesday to decide whether to adopt in full an international definition of anti-Semitism, after internal strife on the issue and souring ties with the Jewish community. The party's governing body decided earlier this summer to accept only a partial interpretation of the International Holocaust Remembrance Alliance (IHRA) definition, reigniting a long-running row over anti-Semitism that has lead to fears of a formal split. Labour's leftist leader Jeremy Corbyn, a veteran pro-Palestinian campaigner, has repeatedly come under fire over his own past comments, actions and associations. The party's National Executive Committee discussed whether to reverse its decision to omit some examples of anti-Semitic behaviour in the IHRA definition from its code of conduct for party members. 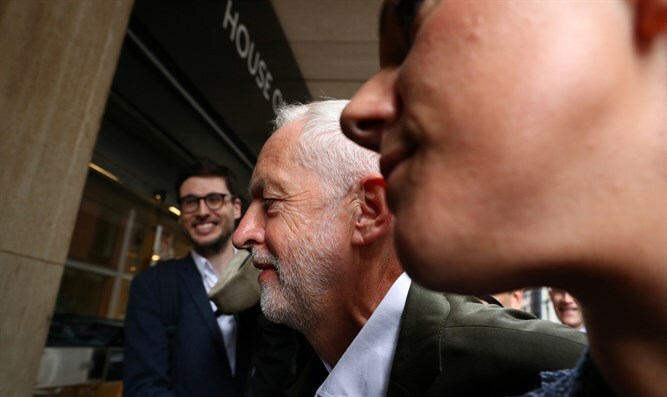 Rival groups protested outside the entrance to Labour's headquarters in London as the meeting took place, attended by Corbyn, who went in through a back door. Stan Keable, secretary of the Labour Against the Witch Hunt group, said the IHRA definition was specifically designed to associate anti-Semitism with criticism of Zionism and Israel. "This whole campaign about new anti-Semitism is a lie," he told AFP. "This is a struggle between the right and the left wing in the Labour Party. This is a struggle for the control of the Labour Party." Meanwhile Damon Lenszner, part of a group of counter-demonstrators, said British Jews felt "under threat". "The far left in any country has always had an anti-Semitism problem, the same as the far right," he said. "Now they've infiltrated and now they control Her Majesty's opposition", which is a "disgrace... it puts shame on the UK". In March, British Jewish leaders wrote a joint letter claiming "enough is enough" over anti-Semitism within Labour, and protests were held outside parliament. The letter claimed a "repeated institutional failure" within the party to tackle the problem and accused Corbyn of siding with anti-Semites "again and again". It said there was "literally not a single day" in which Labour spaces, either online or in meetings, did not repeat "slanders against Jews". The letter claimed Corbyn "cannot seriously contemplate anti-Semitism, because he is so ideologically fixed within a far-left worldview that is instinctively hostile to mainstream Jewish communities. "Corbyn did not invent this form of politics, but he has had a lifetime within it, and now personifies its problems and dangers."